It was late in the year when I heard my next Bowie single. 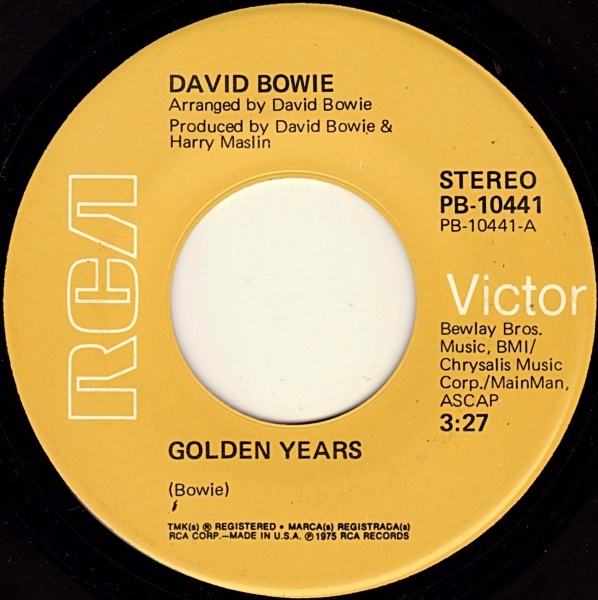 “Golden Years” had a sophisticated R+B feel to it that carried on from the funk of “Fame” but remember; this was the third David Bowie song I’d ever heard! The albums were not even abstract entities in my world. The US top 40 was my musical window on the world and it was thin and narrow. I liked this song a lot, as well. The vocal [and especially the backing vocals] were vibrant and robust. The singing on the middle eight is as good as it gets for me. The meter was captivating and percussive and the crescendo at the end was a thing of beauty. I was happy to see the single climb the charts up to the number ten position by early 1976. I enjoyed hearing a song this complex and noted as much when comparing it to the surrounding pop hits of the day. I was looking forward to hearing more songs from this David Bowie. But I would not for several more years. At least on the radio. For the next two years, I would only hear Bowie sing on television. In America, there were shows like American Bandstand and Soul Train, and Bowie famously appeared on the latter, but I did not watch these shows. They came on Saturday afternoon where I lived, and that was not time for watching television. Instead, I saw Bowie on prime time TV. His famous appearance on the Cher TV show was at the time of “Golden Years” release. In my house, we watched the “Sonny + Cher” program and by 1974 they had divorced, with each star getting their own show before reuniting, at least professionally, in 1976. In 1975, Cher performed an insane song medley with Bowie on her program that was all over the map, but started and ended with “Young Americans.” I have no recollection of seeing this, but like I said. Our was a “Sonny + Cher Show” house. We probably would have watched Cher go solo with Bowie guesting. The whole of 1976 passed with no further exposure to David Bowie. The next year was the year when disco music took over America. “Star Wars” began writing the history of modern Hollywood and special effects blockbusters that’s still with us today. 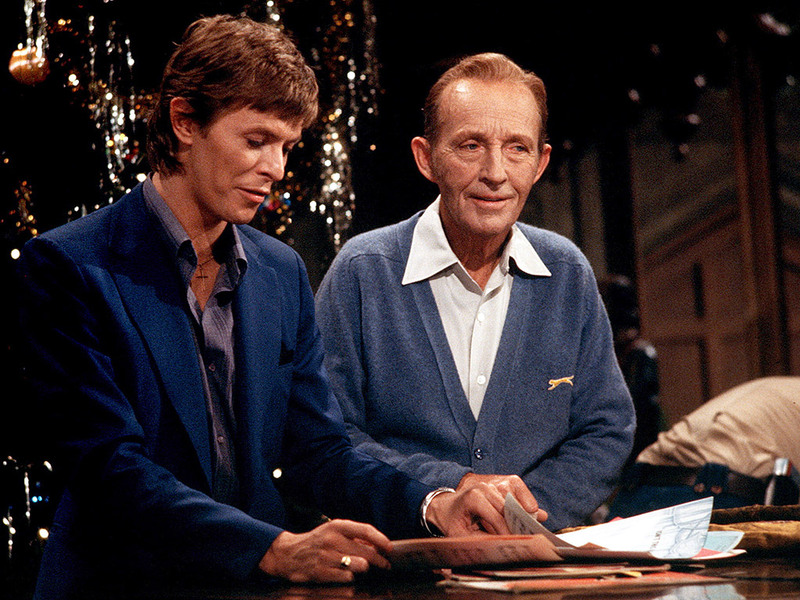 I was fourteen and in junior high school when I saw that David Bowie was scheduled to be on that year’s Bing Crosby Christmas Special. I highlighted the TV Guide and dutifully watched it to see the interesting guy who had been m.i.a. to me for almost two years. The last I heard from him was “Golden Years.” A fantastic song, and then… crickets. Where I lived, any way. I definitely remember watching this show and wading through the usual Christmas sludge to see what Bowie would be doing on the show. What would he do? How about sing a duet with Bing Crosby! History has retained playbacks of the song for yearly usage around Christmas, thankfully. When MTV showed the clip in 1982, RCA released a 7″ single which entered my Record Cell many years later when my wife bought a copy at a yard sale. It remains one of those surreal matchups that were typical of the late 70s period where I was not hearing any David Bowie music except for what the television brought into my home. This entry was posted in Bowie, Core Collection and tagged 1975, David Bowie, stationtostation. Bookmark the permalink. When Young Americans came out, it was seemed to stick around for a really long time. This was fine with me. Young Americans saw me into turn from tween to teen. Golden Years made the radio as soon as it was released near Christmas of 1975 and I listened too it so much, definitely singing along as I was want to do, that my Mom wrapped it as a surprise gift along with some Sears t-shirts (yes I can be a bit eidetic when it comes to music) among my presents that year. When Station To Station came out just as 1976 came, I had to have it. It was a strange, scary and mysterious album. Some of the songs were really difficult for me to understand, so I relied on reviews of that album I could read in Rolling Stone and other magazines I could find. This didn’t help much and was my first exposure to “Rock Critics” ‘talking a lot and not saying anything’ (thank you David Byrne). But I did recognize that things were different. The title track was probably the longest song I had ever heard to that time and it was like a short story as much as a rock song. And it wasn’t operatic like Queen. Bowie sounded scared and nervous. 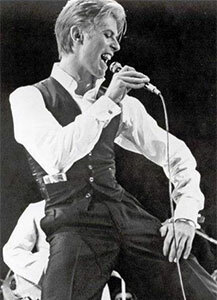 What I remember was the first time he sang about the return of The Thin White Duke, I was hooked. I played it the dark (still do sometimes) and it filled the room and me with an excited fear. I didn’t know anything about Krautrock – and wouldn’t for another 5 or 6 years really, but I did know I hadn’t heard music like that before. Then the song sort of took off, like a soaring bird. I have a feeling Jim Kerr and Charlie Burchill heard much the same thing I did as it’s imprinted all over those early Simple Minds albums. As fascinating and educational Station To Station would be, it was the next two songs on the album which have endured among my favorites of all of Bowie’s canon. Stay is the unwieldy, funky, faux-progressive heart of Station To Station. There has always been so much going on to move the rhythm forward on Stay that Earl Slick brittle and emotional guitar soloing just gets cushioned by it. TVC-15 is the ONLY David Bowie song to be released on my birthday. Did I know it at the time – honestly no, I didn’t but, it was a song that I DO remember driving my Dad crazy. I would walk around the house, in the yard, down the street, singing just “Oh my TVC-15, oh, ohh…” all day everyday. Little did I know then, how drawn to simple repetition I was.